Peel and cube watermelon, then purée. Pass through a sieve into a measuring cup to extract juice. Fill ice cube tray approx. 2/3 of the way up with watermelon juice. Add an equal numer of frozen blackberries to each cube. Freeze for approx. 6 hrs. or until frozen through. Add an ice cube to each glass, then fill with dry sparkling wine. 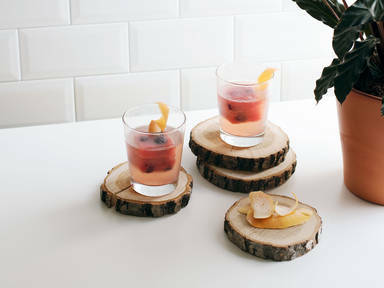 Garnish with grapefruit zest. Cheers!